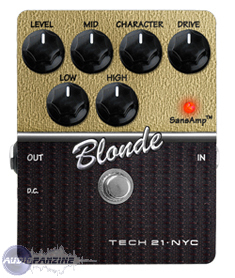 Blonde, Guitar Amp Simulation Pedal from Tech 21 in the Character Series series. 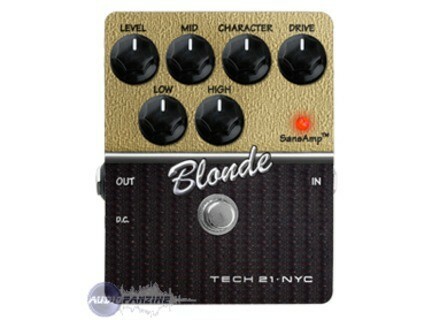 Product replaced by the Tech 21 Blonde V2. As usual with Tech21 Sansamp: numrique no, no simulation algorithm, no lamp, no effect. It's crude foundry Monotachi! But yes, it's anything other than the pods and other vox tube to 400,000 option, none of which really stands out. The pedals are used in a console. Job title on an amp it well but its also really Intrets simulate an amp through a PA system. A little reverb (holy grail) and a small disto APRS before quasiement can do everything and have a sound ventail trs wide. What I find remarkable about Tech21 (I also psa1 the SansAmp rack) is that the dynamics of the guitar is always respected. I have not tried other pedals of the SERIES, but the blonde (170 euros course ...) is really crdible. But this is not a gimmick!